The 4 star accommodation offers a double bedroom in the house and a zip-link bed in the Holiday Cottage. 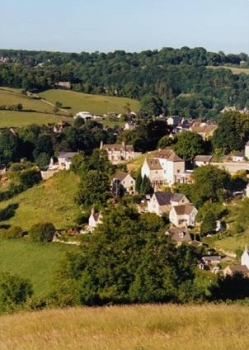 The property is on a bus route to Stroud or Tetbury, albeit only 4 times a day. Connections to Bath, Gloucester and Cheltenham from Stroud make this a suitable place to stay for venturing further afield, although we offer some lovely walks along the canal, across the common to the ice ceam factory or along leafy lanes. The hostelry at the bottom of the hill caters for all palates and is only a walk away.